Louisiana just proved how cruel the drug war can be, as the state’s Supreme Court upheld an 18-year prison sentence without possibility of parole – for possessing 18 grams of cannabis. In 2014, Gary Howard was convicted of “marijuana possession with intent to distribute” and a Caddo parish judge handed down the harsh sentence, labeling him as a “habitual offender” for a 2008 firearm possession conviction. Chief Justice Bernette Johnson blasted the “outrageous” judgment of her colleagues, who made an arbitrary decision to ruin Howard’s life. 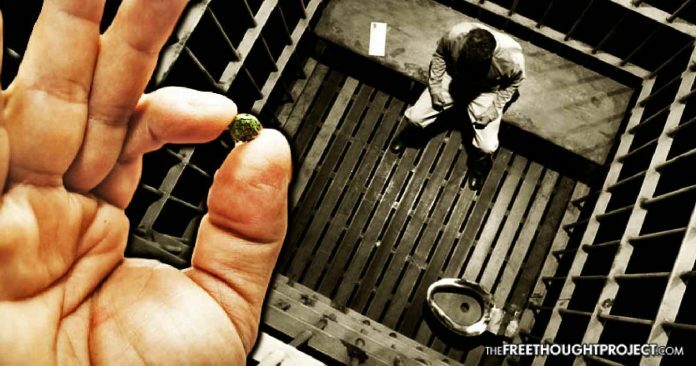 “As a practical matter, in light of the inconsequential amount of marijuana found, imprisoning defendant for this extreme length of time at a cost of about $23,000 per year (costing our state over $400,000 in total) provides little societal value and only serves to further burden our financially strapped state and its tax payers,” wrote Johnson. Johnson went on to suggest that authorities “overreacted” because a firearm was found during Howard’s arrest, resulting in a charge for which he was later acquitted. The fact that, in one state a person can be locked in a cage for 18 years for possessing a plant, while in other states a person can go to a store and legally buy the same amount of the plant, underscores a broken, thoroughly corrupt system. For decades government has carried out an immoral War on Drugs, created for the purpose of stifling dissent, oppressing minorities and enriching the corporatocracy. To this day, federal government maintains cannabis as a Schedule 1 narcotic, and we see prohibition serving the same goals. Even though most states have acknowledged the medical benefits of cannabis, legalizing its use, the feds continue a policy of deliberate ignorance – and it’s no coincidence that Big Pharma profits from prohibition. This is why pharma companies lobbied against state legalization efforts, admitting that legal cannabis threatens their profits. The Louisiana Supreme Court decision shows that the Reefer Madness mentality is alive and well in the cretins that inhabit the halls of ‘justice.’ Even as 60 percent of Americans now think recreational cannabis should be legal, arbiters of ‘justice’ have no reservations about locking people in cages for possessing said plant. The silver lining is that judges such as Bernette Johnson are not afraid to point out the absurdity of these sentences, which can only be called a war on people.